Ozzy Blackbeard: Almost Ovals is almost finished! Almost Ovals is almost finished! Honestly! I've one more row to do before I start the last repeat. And what spurred me into action? I've been off work since Tuesday because I have a cold. I'll spare you the details, but there's been a lot of lying on the sofa with my TV blanket, watching Charmed and knitting. I am considering buying blocking wires to block this, because the thought of having to pin this out makes my head hurt. I was wondering if blocking wires can be used for non-lace projects though. Does anybody have any experience of this? The colours aren't showing very well in these photos, it's more of an emerald green. When it's finished I'll try and take some photos in better light. 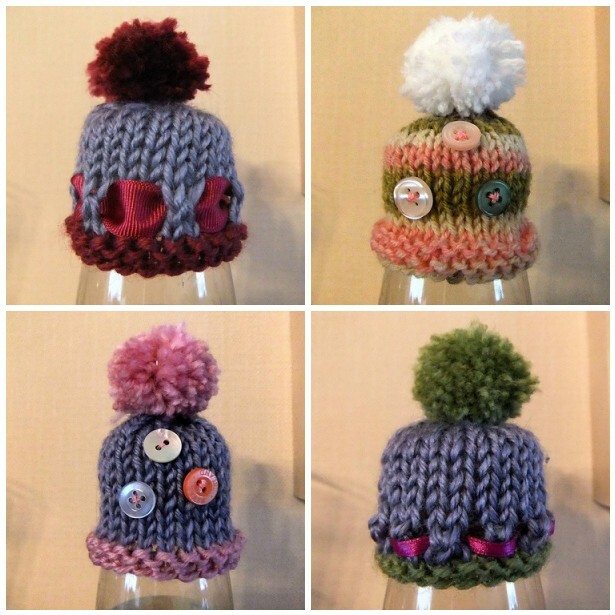 And here are my next four Innocent Smoothie Hats. There appears to be a ribbon/button theme going on - I didn't realise that until I went to take the photos. this look so complicated...sigh, I wish I could get to this level of knitting without putting in the hard work. Oh! I feel your misery I've been off college with the same thing since Wednesday, today is the first normal day I've had. Loving your little smoothie hats their gorgeous. I bought blocking wires, I've only really used them for lace blocking but then again I've never really thought about using them for anything else, oh I have for blocking little non lace blanket squares, 4 squares at a time on 2 wires :) silly me. Sorry you've not been feeling too great, but your Almost Ovals is looking great! Can't wait to see some blocked photos next time! It looks like you've got a garter stitch edge on the scarf - you should be able to thread the wires through the garter stitch, either where it meets the body of the scarf, or just under and over one of the stitches. It'll be more fiddly than it would be if you had yarnovers near the edge, but it is doable - I've done it! And it'll make the edge much straighter than pins would. Hope your cold clears up soon. Your ovals knitting is fantastic though!! !